This blog is on hiatus until Oct. 22, as I'm taking a French-style 3-week vacation to French Polynesia. I could set up some wine and food posts to auto-publish, but a blog is a conversation, not a lecture. I love scuba diving, but rarely go in California because the water is too cold here. French Polynesia has the best diving I've experienced, plus the food is reasonably good because they don't call it American Polynesia. Unlike in Micronesia, we didn't get Spam for breakfast OR dinner. You go for the visibility and warm water and abundant fish life and colorful soft corals, but I had two of my most memorable dives there because of encounters with big critters. 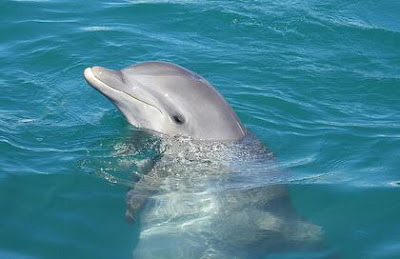 Dive 1: Dolphins usually stay away from divers because they don't like the noisemaking Scuba tanks we wear on our backs. They have excellent senses and know exactly where we are; they like to follow dive boats and jump alongside for fun. But they usually avoid us underwater. On this dive, the very first dive I made in Rangiroa in 2005, we had been in the water maybe 2 minutes when a dolphin about 7 feet long swam up to me and peered me right in the eye from about the same distance as you're looking at this blog post. I once swam with dolphins in a big pool at a research center in Florida. The researchers told us our job was to amuse the dolphins, who are great swimmers and quickly get bored because we're not. So we were told to sing aloud underwater. I did a medley of my best karaoke songs, and was rewarded with a little dolphin interaction. Here in the wild ocean, I was stunned to be favored by the dolphin's attention. It ignored my wife and the dive guide and came right to me. I remembered the pool. So I started screaming the first song to come into my head, Soundgarden's "Jesus Christ Pose." I'm yelling into my mask, and it sounds like "WWWMMG mmmm rrrr gggg mmm nn yrrrrr wwwwww ccrrrr pooooo." The dolphin was entertained; they don't get many touring heavy metal bands in Rangiroa, especially underwater. He swam around me head to tail at first, and then a few circles around my head, making eye contact the entire time. He spent probably only 2 or 3 minutes with me, but it was among the best 2 or 3 minutes of my life. And now, instead of the imagery in the video I linked to, whenever I play "Jesus Christ Pose" I close my eyes and remember the intelligent, amused eye of that dolphin. My friend Ashley says the dolphin was probably thinking, "Wow, I haven't heard that since the '90s." Dive 2: We were at the end of the lagoon off Fakarava at a spot where the ocean flows in and out through a relatively narrow channel maybe 30 meters across. Everything collects there, all up the food chain, because of the flow. The top of the oceanic food chain was well represented by sharks. I've never been around so many sharks. 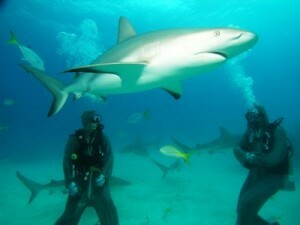 Grey sharks, white-tipped reef sharks, black-tipped reef sharks, lemon sharks, nurse sharks: It was a shark party. Fortunately there were no great whites or tiger sharks that I could see, because those scare me. We had been around the others underwater a few times and had no fear: like dolphins, sharks don't like divers because of the noisemaking Scuba apparatus. They much prefer to snack on surfers. But still, hundreds of sharks within your visible range is noteworthy. A lot of sharks were hanging out in the gap between lagoon and ocean, going up and down as the current flowed by them. This was unusual behavior, as most sharks swim constantly with a no-nonsense look in their eyes. They weren't chasing food; they were just hanging in the current. It took me a while to realize they were surfing. We know dolphins are playful, but I had never heard of sharks doing anything for the fun of it. So I sat on the bottom and watched the sharks surf. There were a few moray eels and big codfish around, and a curious shark decided to take a bite out of one of the codfish, maybe 10 feet away from my wife and I, to see if it tasted good. I happened to be looking to see the bite: It was tentative, almost delicate. A small cloud of codfish blood floated up; in the underwater light it looked greenish. In the time it took you to read that last sentence, 25 sharks were thrashing around the cod. Then 50. Pieces of cod flew out of the mass and the greenish cloud grew. I had never seen sharks move with intention before. I didn't see swimming. I saw something more like a laser beam. First the shark is behind my head -- and then it's 5 meters in front of me, and all I saw was the water disturbance and maybe a slight motion line like in the comics. Wow. Remember what I said about no fear? Not anymore. Shark feeding frenzies are impressive on TV, but this was terrifying at close range. My wife and I were down there alone, no guide. We looked at each other and gave the thumbs-up symbol for "let's get the hell out of here." We weren't very deep, maybe 12 meters, and hadn't been down very long, less than 15 minutes. We didn't rocket to the surface, but we didn't take the usual safety stop at 3 meters; it seemed safer to be on the boat. The boat driver was surprised when we appeared so quickly. "Did you have an equipment problem? Do you want to go back in?" Nope, we were satisfied. Sometimes you stay underwater for an hour and see a bunch of small fish and have a nice dive and get your money's worth. Here, we had gotten our money's worth as well, just a lot faster. So those are my previous French Polynesia dive stories. I'm auto-publishing this before I leave (so this post isn't a conversation, sorry), and depending on the timing I may actually be underwater when you read this. I'll publish something Oct. 22, even if it's just a photo I've been holding onto of the world's tiniest cheeseburger, just to let you know I didn't end up as fodder for an Internet-savvy shark's food blog post. Until then, drink well, for tomorrow we dive.